No eggs? No problem. 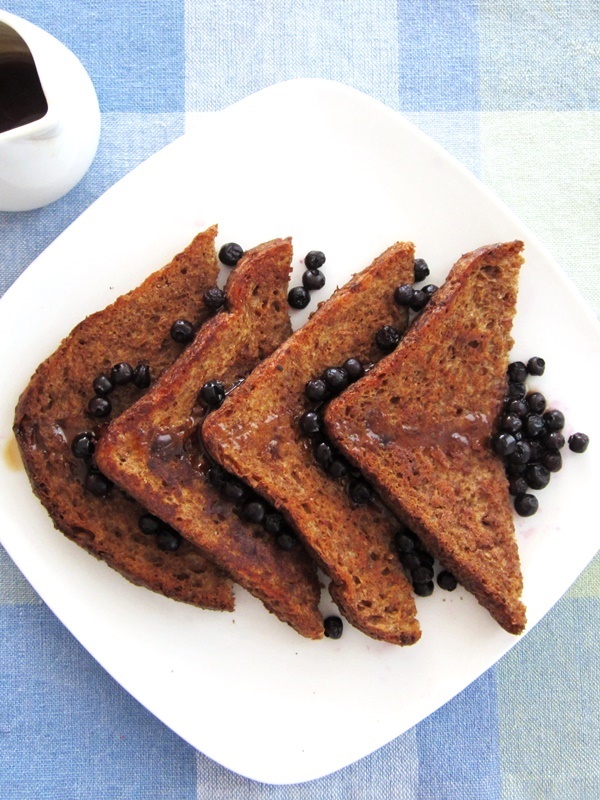 This vegan French toast is a full pantry recipe that will even please egg lovers! 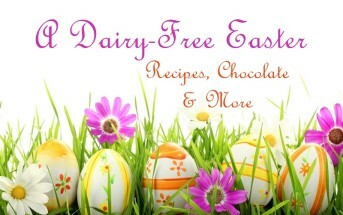 And of course, it is dairy-free, light, nutritious, versatile, and optionally gluten-free. 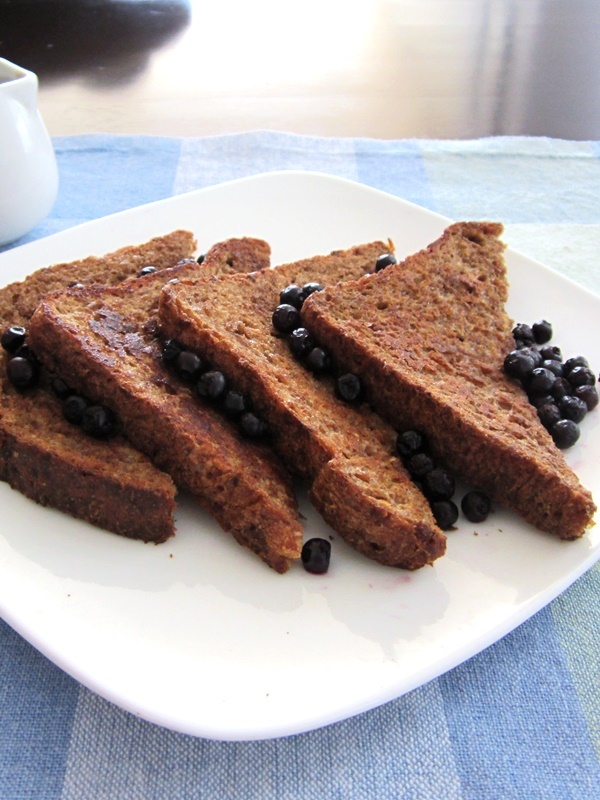 So what’s the secret behind this cinnamon buckwheat vegan French toast? 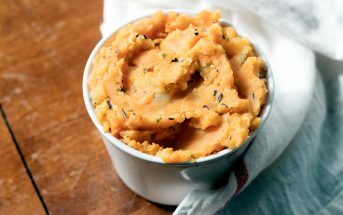 Aside from the standard ingredients (milk alternative, sweetener, an flavoring), a little flour is used to thicken (buckwheat works amazing for flavor, heft, and gluten-free, if needed), and a surprisingly savory ingredient is added to mimic the richness of egg yolk: nutritional yeast. Don’t let the name deter you. Nutritional yeast is a seasoning that adds depth to dishes, like this vegan French Toast, and a supplement that adds a little does of vitamin B12 (great for vegan recipes! ), thiamin, and even protein. For this vegan French toast and most recipes, flaked nutritional yeast works quite well. It is easy to measure and readily dissolves in liquids. 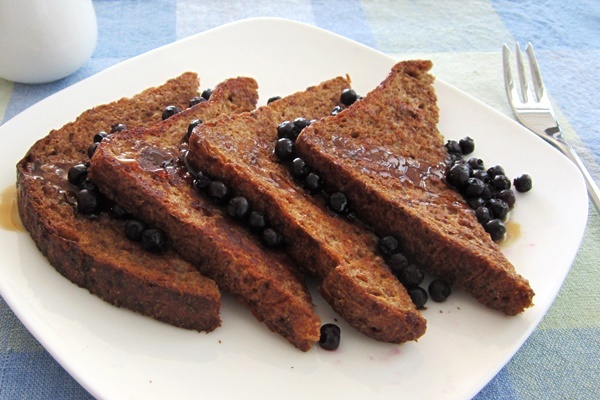 Serve this vegan French toast with a drizzle of pure Grade B maple syrup (for the most flavor). Other delicious toppings include fruit (I used wild blueberries!) and/or a pat of dairy-free margarine. Also, the leftovers do freeze well. Simply pop a slice in your toaster or toaster oven until reheated and crisped to your liking. By ingredients, this recipe is dairy-free / non-dairy, egg-free, optionally gluten-free, optionally nut-free, peanut-free, soy-free, vegan, and vegetarian. Just be sure to use the milk alternative and bread options in this vegan French toast that are appropriate for your allergies and dietary needs. 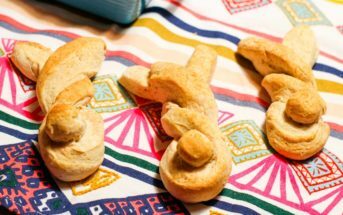 I’ve shared this recipe with Gluten-Free Wednesdays, Allergy-Free Wednesdays, A Wholesome Bunch Link Party and Foodie Fridays! I learned this French toast cooking process from an Alton Brown recipe. The man just knows science! Don't let the added step scare you - this becomes a quick little production line that flows quite seamlessly. Also, wholesome options are fabulous in this recipe - we use sprouted whole grain bread (it tends to be drier, so it works quite well!) and coconut sugar. I never thought to use dairy free milk for french toast. I am not sure why, it makes perfect sense, I would be honored if you would come and share this recipe at Foodie Fridays where I co-host each week. Infusing some wholefood recipes into the mix would be awesome. Hope to see you there.